Cat's Eye harmonizes Ketu which is traditionally known as the "tail of the dragon". In Jyotish, Ketu is the descending node of Chandra (Moon). It's influences are similar to Mangal or Mars and include liberation, abstract thinking, asceticism, non-attachment. This protects its wearer from hidden enemies, mysterious dangers and diseases. It is normally milky in color. The gem is very hot in nature. In the event that it does not suit the wearer, the gem sometimes gives immediate signals like uneasiness, restlessness etc. 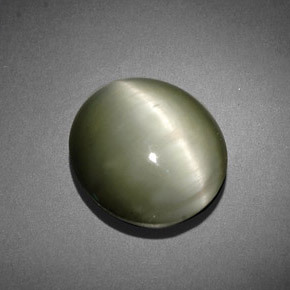 Cat's Eye is supposed to counter the evil effects of Ketu and diseases caused by Mars. It is also called Lehsuniya or Lahsuniya Stone. How to know that Cat's Eye or Lehsunia Gemstone suits me? 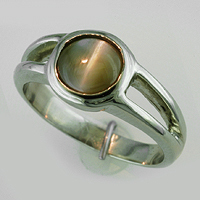 Know Whether Cats Eye Stone will Suit You? We have full fledged facilities to make Gold/Silver Rings/Pendants/Bracelet of the given size, embedded with your Astrological Gem Stone/Birth Stone. We are makers of Gold Jewelry studded with Precious and Semi-Precious Gemstones/Birthstones, diamond & colored gem stones, Silver/Gold Rings, Pendants, Bracelets, Earrings and all types of Stone Beads. We have full facility to make Panchadhatu Cat's Eye Ring. These rings are composed of five metals namely Gold, Silver, Copper, Iran and Zinc. Together they are referred to as Panchdhaatu.These Rings are known as Panchadhatu Rings.